TEHRAN, Mar 19 2012 (IPS) - Last week’s unexpected reappointment of Iran’s former president Akbar Hashemi Rafsanjani as the chair of Expediency Council has provoked considerable speculation here about Iran’s future political trajectory as it faces unprecedented economic pressure and military threats from Israel and the United States. To most observers here, it suggests that the regime’s most powerful figure, Leader Ali Khamenei, is not yet ready to eliminate a key centrist figure in the Islamic Republic despite the fact he himself has done much to sideline Rafsanjani since the 2009 contested presidential election. The appointment ends months of speculation and expectations by the country’s hardliners regarding Rafsanjani’s forcible retirement from public life, although it remains unclear whether his re-appointment is anything more than symbolic given the conservative sweep in the Mar. 2 parliamentary election. Many hardliners identify Rafsanjani as the behind-the-scenes figure challenging the results of the 2009 election, as well as Khamenei’s leadership. And his coy remark after voting in this year’s election that “if the same votes are cast as announced, we will have a good Parliament,” only added to the fury of his hard-line detractors who called for his removal. Rafsanjani has chaired the Expediency Council since its inception, first as the president of the republic and then through successive five-year appointments since he left office in 1997. But his relationship with Khamenei and his inner circle has deteriorated steadily since the 2009 election. For example, Rafsanjani’s website, which publicised his views and recollections of the Islamic Republic’s history, was recently shut down by judicial authorities. Moreover, his children have come under tremendous pressure. His son Mohsen was forced to resign as the manger of Iran’s Metro system; his activist daughter Faezeh was handed a six-month prison sentence last month for speaking out against the system; and his youngest son Mehdi has been living in self-exile for over a year out of the fear that he will be arrested for his activities in the 2009 election. Rtafsanjani’s persistent criticism of President Mahmoud Ahmadinejad’s performance, which in the past several years has led to the latter’s boycott – in defiance of the law – of Expediency Council meetings , has also alienated him from the president’s followers. 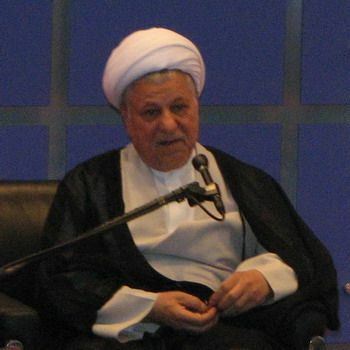 Until May 2011, Rafsanjani also served as chair of the Assembly of Experts, an elected body of 86 clerics charged, among other things, with electing and removing the Leader. But after much pressure, apparently including behind-the-scenes lobbying by Khamenei himself, he agreed not to seek re-election. Rafsanjani’s re-appointment to head the Expediency Council is thus all the more remarkable, suggesting that he has maintained his standing within key constituencies of the Islamic Republic. The Expediency Discernment Council of the System, as it is formally known, is an administrative assembly appointed by the Leader and was created in 1987 by the revolution’s leader, Ayatollah Ruhollah Khomeini, to resolve differences on legislation between the Parliament and the Guardian Council. A constitutional revision in 1989 gave it legal standing as an advisory body to which the Leader could refer significant issues for resolution. In 2006, Khamenei further extended the Council’s powers by delegating to it some of his own supervisory authority over all branches of the government. Since then, however, Khamenei has consistently prevented it from fulfilling that role. As Rafsanjani pointed out in a recent controversial interview with Etemaad Daily, Khamenei has done this by simply not responding to the operational guidelines submitted to him by the Council three years ago and by demanding that it not insert itself into controversies regarding alleged violations of the law by the Ahmadinejad administration. The Islamic Republic’s Constitution gives the Guardian Council the right to veto laws passed by parliament that it deems either un- Islamic or unconstitutional. But if the parliament chooses to challenge a Guardian Council’s veto, it can refer the issue to the Expediency Council. In the past, the council has played a key role in overcoming the Guardian Council’s resistance on issues as varied as removing barriers to foreign investment and increasing the minimum marriage age for women. The continued harassment of Rafsanjani’s family had convinced many observers that Khamenei would finally remove the former president from his last public position. But this did not happen. It is hard to imagine the move to be “out of the longstanding friendship between the two men”, said a political activist named Alireza who noted that Khamenei did not hesitate to remove from the Council Rafsanjani’s brother, Mohammad Hashemi, and former petroleum minister, Bijan Namdar Zangeneh, who had played an active role in the presidential campaign of Mir Hossein Mussavi in 2009. The Mar. 2 parliamentary election may have also contributed to the decision. Although the Interior Ministry announced that 64 percent of eligible voters cast ballots, scepticism about the official figures is widespread. Regardless of Khamenei’s true reasons, the message received by the public of Rafsanjani’s re-appointment, wrote Sadeq Zibakalam, another political science professor at the University of Tehran, in the reformist Shargh newspaper, was one of support for moderation against extremism. “As much as his re-instatement (undoubtedly pleased) the moderates and those who have a concern for the system and the country’s future, it was far from pleasing to those currents and personalities who are neither concerned about the future of the system nor the country in 10, 20, or 30 years,” Zibakalam wrote in his column. On the other hand, the re-appointment could prove merely cosmetic unless Khamenei relents and approves the powers the Council proposed in its guidelines three years ago. “What is the use of spending hours and months of expert testimony and work …if the executive branch shelves (these plans) and there are no instruments for making sure that these plans are properly put into effect,” asked Zibakalam. That will likely be the true test of whether Rafsanjani’s reappointment signals a return to moderation, balance, and even reconciliation after several years in which the regime has taken an increasingly hard-line stance.